Back to Reality, Leeds United 2017-18 Out now!! Autographed copies available direct from me. The season started with great optimism; a change for the long suffering Leeds United fans whose loyalty to their club are second to none. After a fantastic start, things changed rapidly and their hopes were dashed once again. Based on Heidi’s popular blog Follow Me and Leeds United; seen through her eyes with highs and lows as a fan travelling both home and away. Her photos show fans from all over the world, follow the team through thick and thin. Heidi’s 50+ year’s support of Leeds United, her passion, love and loyalty for her club are shared with thousands of other fans who want to be part of her blog and photos. Away tickets sold out minutes after going on sale. Any football supporter would be able to relate to the loyalty shown and enjoy the read with Heidi’s view of games seen as a fan for the fans. A talent of talking to anyone from all walks of life was feedback given. 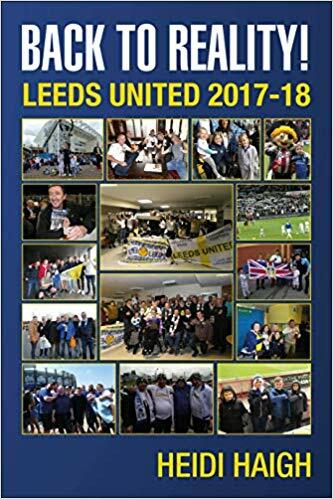 Follow Me and Leeds United; Once a Leeds fan, always a Leeds fan; The Sleeping Giant Awakens, Season 2016-17 and co-author of The Good, The Bad and The Ugly of Leeds United – Leeds United in the 1980s. The 2016–17 season saw the sleeping giant, Leeds United, stirring once again. After years of poor management and owners lacking in aspiration, the hopes of the fans were raised before being dashed at the final hurdle. The Sleeping Giant Awakens is based on Heidi Haigh’s popular blog Follow Me and Leeds United, shared by Leeds United’s worldwide fan base. Heidi shows the highs and lows of a Leeds fan travelling to games, both home and away. Heidi also takes photos at games, which tell their own story but also show the camaraderie amongst the loyal support. Many of the original photos from the blog are featured in the book, including photos of fans at the games. Heidi has supported Leeds United for over 50 years and was used in a promotional video for season tickets in July 2017, which had over 50,000 views. She is loved and respected by other Leeds fans for her loyalty to the club. She is the author of three other books: Follow Me and Leeds United; Once a Leeds fan, always a Leeds fan; and The Good, The Bad and The Ugly of Leeds United! Leeds United in the 1980s (co-authored with Andrew Dalton). The Good, The Bad and The Ugly of Leeds United takes an in depth look back at what it was like following Leeds United in the 1980s. Speaking to former players, fans and journalists, it will take you on an incredible journey. From relegation in 1982 to the heartache of the play offs in 1987 and finally promotion in 1990, the book also takes a look back at the off field issues that dogged the Whites and will take you on a rollercoaster of emotion. All the incidents are covered from the tragedy of Birmingham City in 1985, to winning promotion at Bournemouth in 1990; the book takes you back over a decade in which the Whites sunk to a new low before ending it on a high. As well as an in depth statistical glossary, which includes results of every game the club played over the decade as well as a brief summary of every player who wore the famous white shirt, this is a must read book for fans. It also takes a brief look back at what was happening in the world in the 1980s so sit back, relax and reminisce over a decade that saw the Whites return to the promised land of first division football after an 8 year exile. Once a Leeds fan, always a Leeds fan is about still following Leeds United despite the ups and downs the club has been through. Staying loyal to their team through thick and thin and never wavering in their support. Heidi shares her experiences of matches that she has been to, including games abroad, right from when she first started going to matches to the present day. There are entries taken from her seventies diary and memories from other decades. Heidi has also included other Leeds fans experiences of following their team, as there are so many different stories to tell. She feels it is important these stories are shared with others, as these memories cannot be taken away. Leeds United have a worldwide fan base that is second to none. The camaraderie between the fans is fantastic and is what makes being a Leeds fan special. A must read for anyone who truly supports their team. Fantastic feedback from Jo-Anne who said she started reading it and couldn’t put it down until she got to the end! ‘Follow me and Leeds United’ is based on a diary Heidi kept in the ’70s when she didn’t miss a Leeds United match, home or away, for seven years. It is about being a girl in a man’s world when Leeds were one of the best teams in Europe. As a female it shows what lengths she had had to go to in order to follow her team and the problems/violence that she encountered for daring to be female and going to football matches. Although based on her experiences as a female football supporter following the most successful club of the era, it brings to life what it was like for all football fans to follow their team during the violence of the 70′s. It is not just about the football, it is about the fun of following your team, the camaraderie and the ensuing lasting friendships. For anyone who followed football in the 70′s, especially if you were one of the rare female fans, this book is for you. Heidi Haigh is a well-known female fanatical Leeds United supporter of over 50 years who is still as passionate a supporter now as she was in the seventies. She is a current home and away season ticket holder and goes to Elland Road with her middle daughter Danielle and her granddaughters Hannah and Laura who take it in turns to go with her. Danielle has been attending games since she was a few weeks old and Heidi’s youngest daughter Emily’s season ticket which she had since before she was born, has been taken over by her granddaughter. Heidi’s trademark beret made her well known amongst players and fans alike, and former players still stop her in the street to say hello. She has had many articles and pictures published, from the Yorkshire Evening Post to the Daily Express.